"I don't carry a gun… I drive." FilmDistrict has recently started showing TV spots for Nicolas Winding Refn's Drive, and one of them has hit the web via TheMovieBox. The best part about it, is that even their TV spots for this are as nearly perfect as the film itself. I love that pink logo - brilliance. Ryan Gosling stars as the driver, Bryan Cranston as his handler, and Albert Brooks as the dirty mobster. This film deserves all the coverage it can get, it's currently my top favorite of 2011, it's that damn good. In addition to this TV spot, I've added the sleek new UK quad poster at the bottom. Check out both below and go see this! A Hollywood stunt driver (played by Ryan Gosling) who usually keeps to himself and moonlights as a wheelman discovers that a contract has been put on him by a local mob boss after a heist that goes wrong. 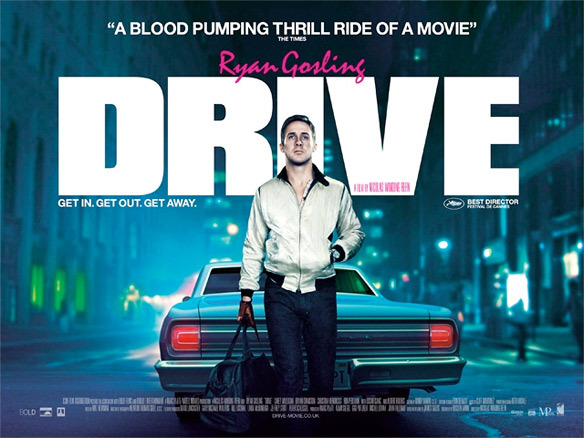 Drive is directed by Danish filmmaker Nicolas Winding Refn, of the Pusher trilogy, Bronson and Valhalla Rising previously. The screenplay was written by Hossein Amini (The Four Feathers, Killshot, 47 Ronin), adapted from James Sallis' novel. This first premiered at the Cannes Film Festival, where Refn went on to win Best Director. FilmDistrict will be releasing Drive in theaters everywhere on September 16th this fall. best poster ive seen for it yet, want one!!! Never do business with Hank Scorpio. I saw it today and it was absolutely amazing, this is a film of the year for me..
Just gonna throw it out there, and hope there's no whiplash. Kinda hate the poster. Sorry to whomever designed it. I agree somewhat, the car makes it look like a cover for a PS2 game. Oh and speaking of Playstation... Driver... why not make that? This storyline looks waay to thin. Driver (at least the first two) had good stories. Ryan Goslings acting reminds me a lot of young Robert De Niro. Same demeanor and tone of voice. I'm really looking forward to this and whatever he puts out in the future.